Park Forest, IL–(ENEWSPF)– Friday night marked the beginning of the newest exhibit at Tall Grass Arts Association, “Pop Art: Editions.” Ruth Crnkovich, Executive Director of Tall Grass, was pleased with the quality of the works on display, "Some pieces in the exhibit are ‘edition works.’ That means there are more than one made. There are fine art editions, which means they are lithographs or silk screens, or even manufactured pieces." The show opened January 26 and runs through March 24. Crnkovich says there is no fee for entry, "but we ask for a $2 suggested donation." “We have a really nice variety of some of the pop artists. We have a Lichtenstein, we have Andy Warhol, we have Christo, we have a Jasper Johns, we have a Robert Rauschenberg, we have a James Rosenquist. And then we have some more contemporary pop artists, as well as a couple of Armenian pop artists." Crnkovich says she's hoping for a good turnout from area schools, “We’re really marketing this to area educators, and they bring in the largest volume, because if they bring a class, it’s 30 to 90 students at a time. Attendance has been really good in the last year, as many as 2,000 per exhibit.” Hoping for at least 1,000 for this exhibit." She says news of the exhibit has already generated some inquiries, “Already we’ve had people trying to get in early. There’s a lot of buzz about it.” Some of the talk has been about the Andy Warhol, “It’s a great Warhol piece. 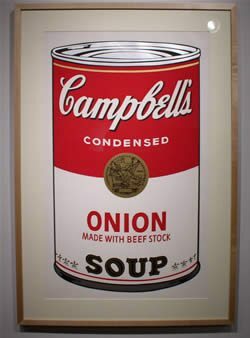 It’s one of the Cambell’s soups, so you know as soon as you walk in it’s Andy Warhol."